I’ve been busy finding new 2012 Swarovski Crystal introductions and checking out changes on the Swarovski.com web site. Today, I discovered that the Swarovski Happy Ducks have been moved to the Swarovski Lovlots group. Previously, the Happy Ducks were grouped with the Crystal Moments figurines. I wonder if the crystal brand is planning to incorporate a Lovlots Pond into the Lovlots City in light of this news. That would certainly be consistent with how they organize this cute little colorful community! Swarovski Punk Duck is new for 2012. It is a silver-grayish duck with a bill ring, red spikes on the head, a choker of spikes, and a skull near the duck’s rump. Swarovski Sir and Lady Duck are an elegant couple. Swarovski Sir Duck is wearing his finest tuxedo and Swarovski Lady Duck is all decked out for a fancy evening. All the Lovlots Happy Ducks are designed by Verena Castelein or Keiko Arai. Some of the Happy Ducks listed above as 2011 retirements can be found in the Swarovski shoppe at 30%-40% off. So, this is just one change that is coming up on the Crystal Exchange America website. Presently, the Happy Ducks are in the Crystal Moments category. Very soon, these Swarovski crystal ducks will be moved from this category to the category “Lovlots & Zodiac”. 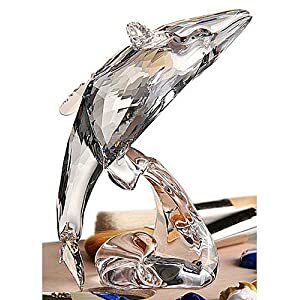 So now, with less than 24 hours til 2012, many Swarovski fanatics have already heard that the 2012 SCS Annual Edition is going to be a Whale named Paikea. For those that did not know, here are the details about Swarovski Paikea from the Swarovski online shoppe. The Swarovski 2012 annual edition is a crystal whale that measures 4 3/4 x 6 3/8 inches. The Swarovski system number is 1095228. The MSRP of the Swarovski 2012 Humpback Whale is $530. Swarovski Paikea is made of shadow crystal with crystal moonlight fins. The whale is leaping over a wave and includes a title plaque, which is in the shape of a wave. The designer of Paikea the humpback whale is Stefanie Nederegger. Swarovski has begun providing personalities and naming the annual editions….Siku the Polar Bear (siku from ‘ice’). And now Paikea (meaning tame whale), which also has an interesting origin. This one is a bit longer more difficult to pronounce (PY keh ah). The Swarovski SCS Paikea Whale appears very powerful in this 2012 annual edition representation. A Swarovski SCS Young Whale, also designed by Stefanie Nederegger, is available to members as an optional purchase. The system # for the Swarovski Young Whale is 1096741 and it has an MSRP of $180. Swarovski previously produced a whale as an SCS figurine. The former Swarovski SCS Whales was available in 1992. This crystal figurine was a mother and baby whale atop an ocean wave. This SCS whale was designed by Michael Stamey and was a part of the ‘Mother and Child’ trilogy. Retailing for $265, this Swarovski crystal figurine generally sells in the range of $350 – $400 at present day. Here’s looking forward to a happy, safe, and healthy new year. I’m looking forward to getting the Swarovski Paikea for my Swarovski collection! 2012 Swarovski crystal introductions are making news now with official releases just around the corner. One of the newest Swarovski Disney figurines is the Swarovski Stitch. 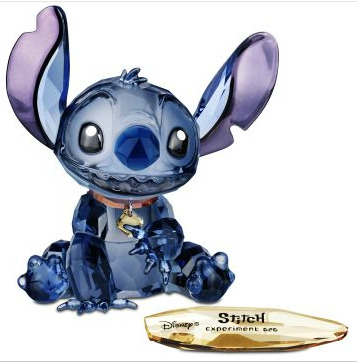 Swarovski Stitch is the Swarovski Disney Limited Edition character that will be available in 2012 only. Limited Edition Stitch is marketed and sold similar to the Swarovski Dumbo in 2011, Swarovski Pinocchio in 2010, Swarovski Mickey Sorcerer in 2009 (offered in 2 different sizes), and Swarovski Tinker Bell in 2008. However, not only did I find Swarovski Stitch on the crystal brand’s web site, I ALSO found Swarovski Stitch Experiment 626. Both Stitch and Stitch Experiment 626 are Limited Editions for 2012. Both Stitch and Stitch Experiment 626 retail for $325. So now that we know what the similarities between Swarovski Stitch and Swarovski Stitch Experiment 626, what are the differences? Swarovski Stitch can be purchased online or from authorized retailers (and other sources too). Swarovski Stitch Experiment 626 is a ‘Limited Online Edition’ available only from Swarovski.com . Swarovski Stitch Experiment 626 sports a reddish color with a golden pendant. Swarovski Stitch does not have any type of collar. And last but now least, the surfboard for Stitch Experiment 626 is also painted accordingly, with “Experiment 626” in black. Swarovski Stitch is available probably most of 2012. Swarovski Stitch Experiment 626 is a Limited Edition of a maximum 626 units. More information can be found about the Disney Lilo and Stitch film series that began in 2002 on Wikipedia. And yet more information is available specifically about Stitch 626 on Wikia. Swarovski Stitch Experiment 626 is identified with the Swarovski system # 1132553. The crystal brand advertises the crystal product dimensions as: 3 1/8 x 3 7/16 inch. Swarovski Stitch is identified with the Swarovski system # 1096800. The crystal brand advertises the crystal product dimensions as: 3 1/8 x 3 5/16 inch. I initially thought that the two Stitch figurines may have been in slightly different poses, then reconsidered thinking that it was merely photographed from a different angle. But now, after seeing minor differences in sizes, I’m now thinking that there may be subtle differences in the poses. Seeing that the price tag was the same on both Swarovski limited editions, I have opted to purchase Swarovski Stitch Experiment 626. Retired Swarovski Disney figurines can be found at the Crystal Exchange America website in the “Disney and Arribas” category. Several weeks ago, our family went to see the action movie ‘Tower Heist’. The movie stars Benn Stiller, Eddie Murphy, and Casey Affleck. It is an action comedy about some hard-working guys who lose their retirement funds to a billionaire swindler and how the men plot to reclaim what is rightfully theirs. Early in the movie, when the plans are being set, the men are challenged to steal some merchandise from mall stores. One of the men enters a Swarovski boutique for the challenge. Below are some pictures from the filming of the movie ‘Tower Heist’ from this exact scene. Here, Casey Afflec is checking out the Swarovski crystal Bella Earrings. The Swarovski boutique is located in the Queens Center Mall in New York. I thought Tower Heist worth seeing. In our area, the movie is still showing in our theatres, so this movie may be a nice holiday treat following Christmas! Last week, I found that Swarovski crystal brand uploaded a new video to YouTube featuring the Swarovski Christmas Tree in France, decorated with thousands of Swarovski ornaments. New York, Sydney, Dubai, Zurich, Hong Kong and now, Megève. The sparkling tradition of the Swarovski Christmas tree adds even more delight to the French ski resort — decorated with 3,000 faceted crystal ornaments and lit by French actress Alice Taglioni, the 2011 Megève Christmas Tree is a sight to behold. The perfect tribute to all the special moments of the holiday season. On the Swarovski site, there is a list of all the Swarovski Christmas tree displays they are sponsoring and decorating. Here’s to all the Swarovski crystal fanatics of the world having a very Merry Christmas! 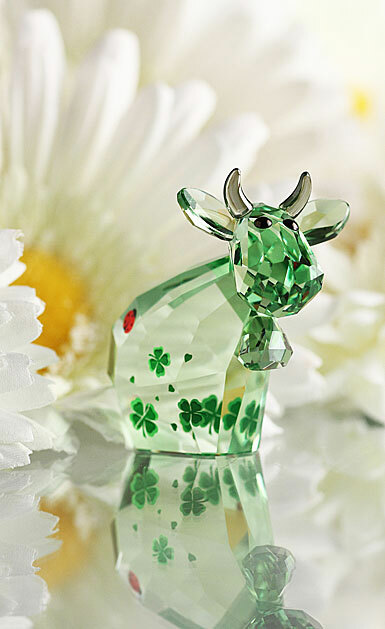 Swarovski has produced figurines under many different product lines. In the 1980’s and early in the 1990’s Swarovski North America was far more independent from Swarovski in Austria. For this reason, there are a number of figurines and product lines that were available in North America or even the USA that were not available anywhere else in the world. And on the flip side, there were “European” pieces that were not made available to USA/North America. I challenged my daughter to read the Julia’s World Story Book: Better Times and provide her opinions of the characters that surround Julia. Following is my daughter’s summary of the book and characters…. Lena is about 12 years old. She is hard-working, but is also sick a lot. Julia is about 8 years old. She is caring and hard-working. Pepi is about 6-7 years old. He is humorous and adventurous. Sali is about 5 years old. She enjoys singing and playing. Mopsy is a fun, mischievous dog. Marian is a young toddler, perhaps 1-2 years old. (Marian is the sleeping baby figurine) Here’s a SURPRIZE….Marian is a baby boy! I think that Swarovski collectors naturally assumed that Marian is a baby girl since Marian is generally a girl’s name, but now that myth has been busted! 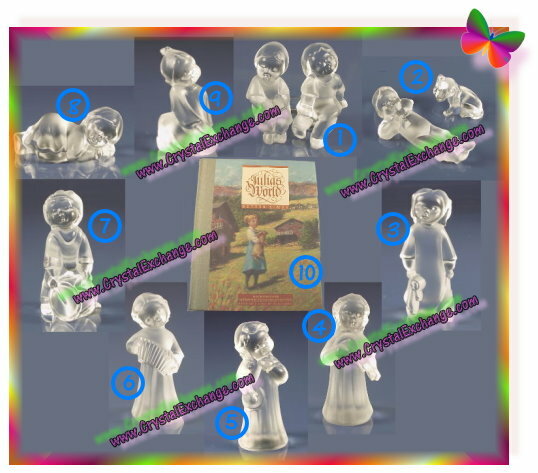 Swarovski took some of the characters in the Julia’s World book, and created frosted figurines. All are generally about 2.5” tall, and retailed $29 – $55 when they were available for purchase 1990 through 1992. Crystal Exchange America has the Story Book and all the Swarovski crystal frosted figurines available in their online store. Visit www.CrystalExchange.com . In the alphabetically ordered list of categories on the left side, scroll down to Vintage Swarovski, then select Julia’s World from the pop-up menu. Several days ago I wrote about a Swarovski Panther figurine that I found on ebay. The article sparked a good bit of conversation about the authenticity of the panther in the auction. Summarizing the ebay product description, the seller states that the Swarovski panther is…. “frosted flocked white (matt)”, “very rare”, “prototype”, about “15 pieces worldwide”. In short, the Swarovski Frosted Panther article here on the Kristall Buzz posed the possibility that the ebay auction panther could be an aftermarket alteration. The reason is due to the ambiguous terminology in the description “frosted” and “flocked”. Frosted means the crystal is either sandblasted or treated with an acid liquid – both would take away/smoothen the facets slightly. Flocked Crystal means that a special textile has been applied/glued to the crystal. It would feel a bit fuzzy/velvety to touch. So what can be stated as fact in the “panther discussion”? Flocked Panther authenticity itself has not been debated on the Kristall Buzz.. The Swarovski Flocked Panther is in the Swarovski Eclectic Panther display (Click here to view a Swarovski Flocked Panther picture in a new window). One of our trusted contacts has indicated to me that Swarovski NEVER frosted the panther, so we believe the Frosted Panther to be an aftermarket modification. The panther authenticity issue stemmed from the use of two terms being used to describe the crystal figurine in the auction: flocked and frosted. Really, I don’t believe it can be both flocked and frosted. The applications seem mutually exclusive. If it is flocked, it would be fuzzy, likely very difficult to clean/remove dust and lint. If it is frosted, the surface would resemble the Swarovski Apollo Bowl or Swarovski SCS Woodpeckers tree trunk. Putting this into another perspective, how would one interpret the following hypothetical item description? It would likely be difficult to distinguish the difference in a full-view picture. Would you conclude that it is the Limited Edition Black Panther? Or would you conclude that the item is the Moroda Panther? The hypothetical (confusing) description “limited edition black moroda panther” (to me) is no different than the “frosted white flocked panther”. While this article should clear up questions about the differences between frosted and flocked, it is still any seller’s responsibility to accurately describe auction items, hopefully eliminating ambiguity and confusion. As a Swarovski crystal collector and possible bidder, I still urge people to use caution and do research when considering to bid or purchase any “unofficial” product, such as “prototypes” and items that “slipped out the back door”. But just how many Swarovski crystal collectors are fortunate enough to be able to see the Swarovski “Eclectic Panther” project which is on display in Vienna? This is an amazing assembly of Swarovski Panther figurines. Swarovski shows just a few of the panthers from the “Moments of Wonder” collection on their own web site: Swarovski Eclectic Panther . Among the pictures, one shown is a hot pink panther (not one that would match my home décor very well) and a very attractive blackish-silverish, almost chrome-like, panther figurine. The two photos below are compliments of Swarovski Vienna. Constant renewal, change and innovation are some of the maxims of Swarovski: the “Eclectic Panther” project is the realisation of the fusion of creative minds in the company. As diverse and variable crystal matter is, so also are the multitude of colours, effects and materials of more than 40 “Eclectic Panthers”. The high precision cutting technique, one of Swarovski’s core competences, has been newly interpreted and applied to much differing materials such as wood, silicone or concrete. I hear that the Swarovski Eclectic Panther figurines have some type of special marking on it to indicate it is a part of this unique collection. It would be interesting to see a close-up image of the marking. 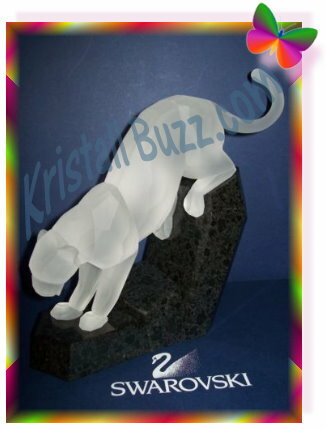 For now, Swarovski collectors can only speculate if the crystal brand might release another Swarovski Panther figurine in 2012 and if so, is it a traditional release or is it a limited edition Swarovski crystal figurine? Yesterday, Swarovski launched their final weekend special for 2011…a limited edition pendant / earring set. Swarovski’s advertises the Etoile Set being limited to 500 sets , which are available through Sunday evening or until they are sold out. This limited edition is the Swarovski Etoile Set. The set features an asymmetric star on a rhodium-plated chain complete with a pair of matching pierced star earrings. This Swarovski limited edition set costs right at $150 and should include free shipping. Curious to know how this limited edition got its name, I googled “etoile” for a definition. Not too surprising, the Miriam Webster Dictionary indicated that it is a foreign term meaning ‘in the shape of a star’ or the ‘principal dancer in a ballet company’. Swarovski also offers the Swarovski Flicker Charm and the stars on the charm to be very similar to the Etoile star. With only about 24 hours remaining, be sure and get your limited edition Swarovski Etoile Set ordered soon if this looks like the perfect gift for the Swarovski crystal collectors in your friends and family circle. Hoping that everyone is having an enjoyable pre-Christmas shopping season! Swarovski Frosted Panther – Prototype or Aftermarket Alteration? During the past couple of weeks, I noticed a Swarovski Soulmate Panther on eBay, which is advertised by the seller to be a very rare prototype. This particular Swarovski figurine just might raise the eyebrows of Swarovski crystal fanatics wanting more information about it. It can be very difficult to tell which items are truly Swarovski prototypes, and which items have after-market alterations enhancements and are misrepresented for sellers to make a buck. The controversy will always remain without official company statements, which I seriously doubt would ever happen. This press release is about a rare Swarovski Poodle purchased by a Swarovski crystal collector from Crystal Exchange America in October, 2010. While official Swarovski literature shows the standing poodle with both a frosted tail and a clear tail, some critics still speculate that the crystal brand did not officially produce both the Standing Poodle with clear tail and Standing Poodle with frosted tail. This press release is about a Swarovski Frosted Mane Lion that is for sale at Crystal Exchange America. I’m not aware of any official company statement regarding its authenticity. Having it for sale on our web site, I do get asked my opinion about the authenticity. I can only say that I really don’t know….the Swarovski Frosted Mane Lion is interesting, and it is attractive. If the price is right and you like it, buy it. But I do not recommend a Swarovski collector purchase it with the impression that it is genuine and that it will increase in value, because there is simply no proof at this time to substantiate the claim. So, now on eBay (a closed auction), is a Swarovski Soulmate Frosted Panther, which the seller claims is a rare prototype, a part of the Eclectic Panther collection, in the Moments of Wonder display at Swarovski Vienna. The seller’s description clearly states “frosted flocked white (matt)”. And that it is “very rare”, “prototype”, about “15 pieces worldwide”. What might be actually concluded about the authenticity of the Swarovski Panther from the auction? The seller indicated that the Frosted Panther is on display at Swarovski Vienna. There is a picture of part of the display, but it is impossible to tell if a Swarovski Frosted Panther is actually displayed there. Why wouldn’t the seller have used a more conclusive photo for proof? The seller indicated that it is prototype, with about 15 produced. One of our trusted contacts has indicated to me that Swarovski NEVER frosted the panther, that the only explanation is that a frosted panther is an after-market alteration. Swarovski crystal fanatics will have to form their own opinion. IF this is a fake (aftermarket enhancement), I think it is sad that society has risen to the level of deceit to cash in from altering a fabulous Swarovski design, then misleading the public that the Swarovski company produced it AS IS. And if it is genuine, the seller is going to have to come up with better proof of the statements in the auction….i.e. high quality conclusive photos of the display, perhaps prototype logos, or official company statement. It will be interesting to follow this figurine through the holidays to see if it does ever sell. I originally saw it listed and closed unsold for $5500 or best offer. Several days later, it was relisted and closed unsold for $3950 or best offer. My recommendation is that everyone should use caution when purchasing crystal advertised as “prototypes”, as this could be extremely difficult to substantiate. Personally, I would even remain leery of crystal figurines that “slipped out the back door”, and the like. I certainly don’t wish to put a damper on anyone’s holiday spirits….I just want to provide some food for thought so that no one ends up with buyer’s remorse about spending a nice chunck of change on what could be a fraudulent figurine (aftermarket enhancement). Today, I received an email reminder that my Swarovski Discount Voucher is good for another 10 days yet. Great news for any crystal fanatics who have been procrastinating about shopping and still want to get that someone special a Swarovski crystal figurine. This voucher is for 10% off (probably a single Swarovski item), with a minimum purchase of $160. Unfortunately, the voucher cannot be used for Swarovski SCS products, binoculars, or the Crystal Myriad sculptures. The Swarovski discount voucher is valid for USA residents, and some other countries. Check your email to see if your country allows the use of the Swarovski coupon. Swarovski crystal fanatics should scan their inbox for the voucher discount before heading off to do shopping in the online Swarovski shoppe! Today, Swarovski has posted the second weekend special, promoted as a limited edition pendant. According to the announcement several weeks ago, there should be 500 pendants available through Sunday evening or until they are sold out. This limited edition is the Swarovski Nadine Pendant. It is a blue tear-drop shaped stone on a silver-colored chain. The Swarovski identification number for the Limited Edition Nadine Pendant is 688961. The Swarovski Nadine Necklace is priced at $100 for the limited edition jewelry feature for the weekend. This weekend special does not have any complimentary earrings, or bracelet like the special for last weekend. Hoping that all Swarovski crystal collectors are having a wonderful holiday season! The Rockefeller Center Christmas Tree Lighting was held yesterday. It was the 79th year for the Christmas tree lighting in New York City. The 2011 tree is 74 feet tall and is decorated with (of course) the Swarovski Star Ornament and 30,000 LED energy efficient lights. I found these terrific pictures of the Rockefeller Tree Lighting at DenverPost.com. There are more on the site and are presented in a nice slideshow. The brief video of the Rockefeller Center Tree Lighting Ceremony was found on YouTube.com. Should I find more Rockefeller Christmas Tree, I’ll try and add the links to this post (to keep them all together). I recently noted a number Swarovski stores running a promotion for Swarovski Photo Ornament Clips. While it appears they may be Swarovski boutiques, the promotion may be available at authorized Swarovski Crystal retailers too (?). The promotion began November 28 and goes until December 4, 2011 or while supplies last. The promotion is for a set of crystallized photo clips. The Swarovski Photo Clips are a free gift with a qualifying purchase of $150 or more. In the Swarovski Crystalllized Photo Ornament Clip set, there are three clips. The first clip is silver / gray and reads “A Moment to Love” with a crystallized swirl below the saying. The second clip is red and reads “A Moment to Cherish” with a crystallized swirl below the saying. The third clip is red and reads “A Moment to Remember” with a crystallized swirl below the saying. 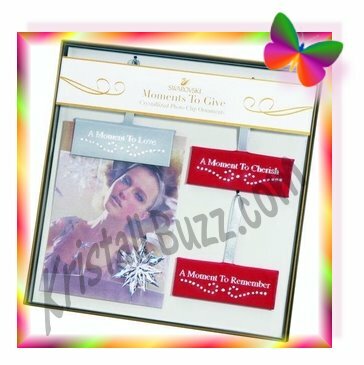 The three crystallized photo clip ornaments are packaged together in a single box, captioned with “Moments to Give”. The photo clips sound interesting….it appears that these Swarovoski Ornaments can be hung in a window by a hook or on a Christmas tree. They would certainly make cute personal gifts from kids to grandparents using school pictures or “a special moment with grandparents and grandkids”.